If island destination is what you are looking for, perhaps you need to look no further than this nature's jewel. Bermuda is a cluster of islands on the north Atlantic with a total area of about 21 square miles. Several islands are joined to the main island with bridges. Being a sub tropical island, the weather is pleasantly warm for most time of the year (April to November) and people are even warmer. There are many stunning beaches in the island and some with lovely pink sandy beaches. Snorkeling is excellent from several beaches while nearby reefs offer views of amazing corals and marine life. And there are amazing caves with awesome limestone formations, aquarium, numerous historical sites, museums, churches, historical forts and even nature reserves and parks. Although the island is tiny, it offers numerous land and water based activities. You can get a lifetime experience of golfing in some of the word's best scenic courses, riding horses along wonderful beach trails, kayaking along the shoreline, take a boat tour for off-shore snorkeling, jet skiing, parasailing, paddle boarding, in-shore & deep sea fishing and lot more. There are over 300 shipwrecks circling the waters around Bermuda and numerous coral reefs that are teeming with marine life. This makes the island a coveted destination for scuba divers and even snorkelers. And there are many operators who offer guided sightseeing tours in private minibuses showing you the main island attractions, or take you on motorized boats for glass-bottom view of marine life or on a sailing catamaran to enjoy a stunning sunset view with cocktails. Such tours operate both on groups (on per person rates) as well as on private charters. You can also hire a taxi for few hours to tour the island and there are several taxi drivers who are government certified tour guides. And if you are a nature lover, you will love to hike along the wonderful trails through reserves, quaint countryside and along the coastline. Hamilton City is the capital of Bermuda and located centrally. The Town of St. George is located at the eastern end and close to the airport. It's a UNESCO World Heritage Site steeped with history. This is where the first settlement took place in Bermuda. And Royal Naval Dockyard at the west end is the main cruise port (although there are smaller cruise ports at Hamilton and St. George as well). Most shops, restaurants, bars and activity operators are located at these three places. Bermuda never looks crowded. There are no billboards or neon signs, and relatively few cars to spoil the wonderful countryside. The houses with gabled limestone roofs and pastel colors fit beautifully into the landscape. You can get around the island using air-conditioned public buses and ferries. Privately operated taxis and minibuses are also popular transports in the island. Ample scooters and even recently introduced battery operated minicars are available on rent to get around the island at your on flexi time. But remember that driving in Bermuda is on the left side of the road. 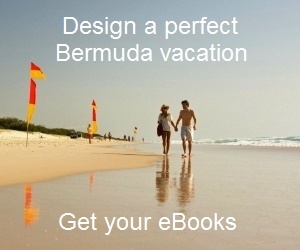 If you are visiting Bermuda, take a look into the Bermuda eBooks to make a great vacation plan in Bermuda and know about the best attractions, guided & self-guided tours, water sport & other activities, great dining & shopping options, vacation tips and lot more. Listed below are the great attractions of Bermuda along with location and ordered by popularity. Go through the links for full description of each attraction along with pictures. Horseshoe Bay Beach (Southampton Parish): A picturesque beach with pink sand and has a curvature of a horseshoe. It has adequate beach amenities including cafe, beach bar, rentals, bathrooms, coast guards etc. This is one of the top 10 beaches in the world and the most popular beach in Bermuda. Crystal & Fantasy Caves (Hamilton Parish): Watch the amazing limestone formations as you walk over the wooden bridge laid over the lake inside. The cave complex offers guided tours. Aquarium, Museum & Zoo (Hamilton parish): Three attractions in one complex, the main one though is the Aquarium. Here you can see amazing marine life and fish of the north Atlantic. Boat Tours: Wonderful group & private tours offered on motorboats, sailing yachts and catamarans. There are tours including glass-bottom views showing stunning corals, fish and marine life, sightseeing tours showing coastline and water landmarks, sunset sailing with cocktail, snorkel cruises and more. Tobacco Bay Beach (St. George's Parish): This is a small but beautiful beach near St. Catherine's Fort. Beach facilities includes cafe, bar, water sport activities including snorkeling etc. Dolphin Quest (Sandys Parish): This is a dolphin activity and training center located within the National Museum complex at Royal Naval Dockyard. Other than watching dolphins perform amazing stunts, you can participate in an interactive session of feeding dolphins and playing with them. Warwick Long Bay Beach (Warwick Parish): This is a half a mile stretch of lovely pink sand offering secluded areas and a sandy trail to several other beaches. Great for snorkeling & swimming. Elbow Beach (Paget Parish): Having a shape of an elbow, this a very popular beach for both tourists and locals. Amenities include a beach cafe & bar run by a hotel, water sport operator etc. Gibbs Hill Lighthouse (Southampton Parish): This is the oldest cast iron built lighthouse in the world and overlooking the Great Sound water area. The panoramic view from the top is awesome. St. Peter's Church (St. George): This is the oldest Anglican church in western hemisphere that has been in use from the beginning. National Museum of Bermuda (Sandys Parish): It showcases the rich history and heritage of Bermuda through numerous exhibits and artifacts, and is housed in a fortress. You will know about Bermuda's past including how the first settlement took place in the island, its slavery period, maritime past, why & how Royal Naval Dockyard was built, how the fortress was built to safeguard the dockyard, collections from Royal Navy, and lot more. The museum is located at Royal Naval Dockyard. Snorkel Boat Tour: In offshore snorkel areas you can see amazing reef fish & marinelife, wonderful corals and even shipwrecks. Group and private snorkel cruises are offered. Port Royal Golf Course (Southampton Parish): Although green fees are very expensive, this course is a dream for all golfers around the world. It is a venue for PGA Grand Slam. Hamilton City Tour: A self guided tour to take you through all the key attractions in Hamilton which is the Capital of Bermuda and also the commercial hub. South Shore Park (between Southampton and Warwick Parishes): Walk along the 1.25 mile sandy trail or the waterline to visit some of the loveliest pink south shore beaches of Bermuda starting from Horseshoe bay beach, to Jobson's Cove, Stonehole Bay and all the way to Warwick Long Bay. Tom Moore's Jungle (Hamilton Parish): This is the only real forest in Bermuda where you can explore many plantations, mangroves, pond and several caves & grottos (where you can even swim). Island tours by minibus: Group or private tours are available on minibus taking you across the island, showing you many top tourist sites while giving you great photo opportunities. Island Tours by Taxi: Hire a taxi by the hour and tour around the island, enjoy the landmarks, lovely scenery, the beaches, visit historical sites and more. Several taxi drivers are also certified tour guides and can plan out a great island tour for you based on your time and interest. Tour Historic St. George: Self guided tour of St. George, the former capital of Bermuda where the first settlement took place in early 1600s. It is a UNESCO World Heritage site and steeped with history. Masterworks Museum (Paget Parish): Great art gallery with about 1,400 masterpiece collections of paintings and artwork. Located inside Botanical Gardens. Cathedral Of The Most Holy Trinity (Hamilton): An awesome Anglican church with Victorian architecture. St. Catherine's Fort (St. George's Parish): This is a historic British fort originally built in early 1600s and later rebuilt. It overlooks the ocean and is fringed by beaches on both sides. Unfinished Church (St. George's Parish): Construction of the church started in 1874 but was never finished mainly due to parish infighting. It is now part of the world heritage site. Royal Naval Dockyard: Being the largest cruise port in Bermuda and with large tourists influx, numerous attractions have come up in the dockyard including national museum, boat and island tours of all kinds, art & craft studios and galleries, boutique shopping mall, many restaurants & bars etc. Nature Walks: Explore some of the nature trails and experience Bermuda's lovely landscapes, shoreline, reserves, parks and gardens. The 18-mile Railway Trail passing across almost the entire length of the island along the north shore is a lovely trail to explore. Hog Bay Beach (Sandys Parish): A 10-12 minute walk through Hog Bay Park would lead to this tiny beach on the western shoreline. The beach is available in low tide and remains free of tourists. Jobson's Cove (Warwick Parish): A beautiful cove surrounded by large rocks keeping the water calm and making it great for swimming and snorkeling. It's located near Warwick Long Bay. Rent a boat and explore islands: Rent out a small motor boat, go off the coast line or into an inland water area like Castle Harbor, and explore many small and beautiful tiny islands. Some such islands have lovely sandy beaches which you can enjoy in privacy, have a picnic, swim out and even snorkel. Bermuda Underwater Exploration Institute (Hamilton): You can demystify the underwater world through a series of exhibits and interactive systems. Few of the great attractions here are submarine and ocean simulators, treasure coins etc. There is also a great restaurant in the building. Kayaking: Great kayaking (canoeing) tours and know about the best operators. Some kayaks have glass bottom to view marine life and some fitted with LEDs at the bottom for night vision. Horseshoe Bay Beach: Picturesque pink sandy beach in Southampton parish with a curvature like that of a horseshoe. This is the most popular beach in the island and therefore most crowded. Tobacco Bay Beach: Small & lovely sandy beach in St. George with a sheltered bay which is surrounded by rocks & cliffs. Great beach for snorkeling and swimming. Warwick Long Bay Beach: Half-a-mile long beautiful pink beach in Warwick parish which remains relatively less crowded. Elbow Beach: A lovely elbow shaped sandy beach in Paget parish favorite to locals and tourists. Jobson's Cove: Beautiful small beach surrounded by large rocks making the water calm and great for snorkeling. It's located in Warwick parish next to Warwick Long Bay. Great self guided tours: Explore the great attractions of Bermuda including beaches, caves, forts, historical sites, parks & reserves etc using public buses and ferries. Island tours by taxi: You can book a taxi on hourly rate. Experienced and knowledgeable drivers double up as excellent guides and can take you around the island. They can create a personalized tour for you based on your interest and let you know a lot about the island and its people on the way. If you are in a small group like 4 to 6, this can be quite affordable as well. Island Tours by minibus: Several operators offer group as well as private tours in their minibuses which can usually accommodate up to 15 persons. Here too the driver is usually a great guide and knowledgeable about the island and its history. Group tours work on per person rates and are usually available for half or full day in set tour packages. Swim & Snorkel Boat Tours: Group tours operating on per person rate take you to offshore water locations where you can snorkel and see beautiful corals, fish and even shipwrecks. Glass Bottom Boat Tours: If snorkeling is not your cup of tea, you can hop into a boat with glass bottom view to see lovely underwater corals and fish, and even a partially submerged shipwreck. Sunset & Sightseeing Cruises: Get a wonderful view of the coastline and many islands from a sailboat or catamaran, and watch the sunset as you sip a cocktail and listen to the captain about the island. National Museum of Bermuda: A large museum spanning across 15 acres of land in Royal Naval Dockyard in a fortress. The museum has rare exhibits and artifacts showcasing Bermuda's maritime & slavery history, traditions & culture, architecture, art & craft, music & dance and lot more. Carter House: Located in St. David's, this is one of the oldest farm houses in the island and now a museum showcasing history & culture of residents of St. Davids. Fort St. Catherine: A large historical British fort overlooking the ocean located in St. George. It houses a museum that showcases weapons & artillery of old British army in the island. Museum at BAMZ: A museum at Bermuda Aquarium, Museum & Zoo complex in Hamilton parish with exhibits showing Bermuda the way it was before settlement took place and the developments. Crystal & Fantasy Caves: Both these stunning caves are located in the same complex in Hamilton parish and have lakes with footbridge. They have beautiful limestone formations hanging from ceiling as well as rising from the bottom. Caves at Tom Moore's Jungle: Also known as Blue Hole Park, this is a nature reserve located in Hamilton parish and has numerous caves & grottos with great limestone formations. Several of such caves have water fed by the nearby Castle harbor and are great for cave swimming. Fort St. Catherine: This fort was built by the British in 1600s to protect St. George which was then the Capital of Bermuda. It's now a great museum with exhibits of old artillery & weapons. Fort Hamilton: It's located in the outskirts of Hamilton City. The fort was built in 1870s to protect the Hamilton harbor which was then heavily used by navy ships. Fort Scaur: Located in Sandys, this inland fort was built in 19th century to protect Royal Naval Dockyard from land based attack by the enemies. Top Snorkeling: Beachside & By Boat: Bermuda has some of the best beaches and offshore water areas in the world for snorkeling. You can see magnificent corals, many colorful fish and myriad of other marine life, and even shipwrecks. Jet skiing: Several operators offer guided Jetski tours from Royal Naval Dockyard, Hamilton and even St. Georges showing you wonderful harbors, islands and marine life along the way. Kayaking: Guided group kayak (canoeing) tours are offered by several operators in the island exploring the coastline and calm water areas. There are single and double kayaks, and even ones fitted with LEDS at the bottom to watch marine life & corals after sunset. Scuba Diving: One and two-tank dives are offered by experienced and well equipped dive centers to explore few of the many great historic shipwrecks, magnificent reefs and marine life. Helmet Diving: Walk on the sea floor amongst amazing marine life as you wear a special helmet and breathe normally through a hose pipe. No need to know swimming. Botanical Gardens: This large parkland is located in Paget and full of plantations of different types including Bermuda's native plants and flowering gardens. A free guided walking tour is offered. This is a large 64-acre nature reserve in Smiths parish with lush vegetation, central brackish pond, view of coastline and strange geological formations. The reserve is excellent for bird watching. Cooper's Island Nature Reserve: A 12-acre nature reserve located at St. David's with view of rocky coastline, offshore islands and several great beaches nearby. Ferry Reach Park: Located in St. George's parish, this is a large park area with a forested land, walking trail, a beach and several historic forts. Bermuda Railway Trail: The trail stretches for 18kms across the island and has several sections. It was originally the track route for Bermuda's railways and now converted into a lovely nature trail with scenic views of the north shore at various sections. Self guided walking tour of St George: Explore the UNESCO world heritage site of St. George's town and its many historic sites. South Shore Beaches & Park: Walk the south shore trail of 1.25 miles and visit some of the top pink sandy beaches including Horseshoe bay beach, Jobson's cove and Warwick Long Bay Beach. St Peter’s Church: Located in St. George, this is the oldest Anglican church in western hemisphere. There are graveyards in the church premises. Cathedral of The Most Holy Trinity: This Anglican church is located in Hamilton and built in Neo Gothic architecture. View of the city from the top of the tower is awesome. St. Anne's Church: This is an Anglican church in Southampton Parish. It was originally built in 1600s. Masterworks Museum of Art: Great art gallery and art museum located in Botanical Gardens, Paget. Bermuda Art Center: Different types of artwork are created and sold here. Located at Royal Naval Dockyard. Craft Market: Large collection of local craft work. Located at Royal Naval Dockyard. Bermuda's Architecture: Bermuda's houses mostly follow the Stuart Architecture with pastel colors and gabled limestone roofs, and many have chimneys, while several churches are designed on Gothic architecture. This trend had set in from the end of 17th century. Great Traditional Homes: Visit some of the great traditional homes in Bermuda to explore the architecture and traditional lifestyle. The concentration of most restaurants in the island are in Hamilton City. Front Street is lined with restaurants and bars of all sorts. Most nightlife options such as dance clubs, night clubs, sports bars, pubs and lounges are also in Hamilton. Royal Naval Dockyard and St. George are the other two locations where you can find several choices of restaurants. Other locations or parishes would have relatively smaller dining choices unless you like to dine in an in-house restaurant of a hotel. The guide to great restaurants & bars would let you know about all the great restaurants & bars in the island by location and category (i.e. budget, mid range or upscale). You can get to know the details about each restaurant including their cuisine, signature dishes, service and ambience. The best budget eateries will let you know about the best cheap restaurants in the island including their cuisine and the best dishes to try. Try the food trucks to get a taste of real Bermuda and the local food Bermudians love. They serve mobile food from trucks and vans at various locations serving hot local food like jerk chicken, shark hash, fish cakes, fish sandwiches, pulled pork, hot dogs and lot more. Guide to best beach bars will let you know the best on-beach bars and ones with great ocean views along with the food they offer. If you are fond of outdoor dining, then this guide to outdoor dining would be useful. Cafes and Bistros are another segment of popular choices when it comes to dining in casual ambience while having great food with beer or coffee. Afternoon tea has been a long tradition in the island. Almost all islanders would take tea served in a pot of china along with finger snacks like cookies, sweets, finger sandwiches etc. When it comes to handcrafted items, it's quite surprising that Bermuda has such a large pool of talents. Starting from exquisite handmade glass items, jewelry & charms on longtails and pink sands to rag and banana leaf dolls, there are plenty of items to shop in Bermuda that are all made in the island. Other items include artwork, pottery, authentic Bermuda shorts, dress materials, accessories etc. Front Street, Church street, Reed street in Hamilton and their alleyways are great places to find the stores of all types. Visit Hamilton shopping to know them all and their locations. St. George's too has several quaint stores. The Somer's Wharf and the shops along Water Street are some of the best places to shop. Somer's Wharf has a collection of stores and restaurants. In Dockyard, The Clocktower Mall is the one to explore. There are many boutique stores in the mall. For complete guide on shopping in the island, visit Shopping Guide of Bermuda. Hamilton City which is the capital of Bermuda and the hub of business, shops, restaurants & bars also has several great tourist sites like City Hall & Art Center, Cathedral of Most Holy Trinity, Hamilton Fort, Bermuda Underwater Exploration Institute, Queen Elizabeth Park and more. Front Street overlooking Hamilton Harbor is the main street in Hamilton full of popular restaurants, bars and stores of all kinds. It is also the venue of the famous summer street festival Harbor Nights. Most historical sites are located in St. George's Town which was the former capital of Bermuda and where the first settlement took place. This is a UNESCO World Heritage site. The town and its surrounding areas have many quaint shops, historic forts, several great beaches and churches. The whole island is divided into 9 parishes or counties. Many great attractions are scattered all across the island in different parishes. For example the great south shore pink sandy beaches are located along the southern coastline of Southampton, Warwick and Paget parishes, famous Crystal caves, the Aquarium and Tom Moore's jungle are in Hamilton parish etc. Go through the links below to know each parish in details along with all the attractions and activities they have including tourist sites, things to do, dining options, shops and lot more. Sandys Parish: Has several nice parks, beaches, churches etc other than dockyard. Southampton Parish: Famous horseshoe bay beach and several other pink sandy beaches are located here. South shore park starts from this parish and stretches towards east to Warwick. Warwick Parish: Lovely Warwick long bay beach is located here. Paget Parish: Well known for Elbow beach and several great beachside hotels. Pembroke Parish: Other than Hamilton City, there are several attractions here including Admiralty Park with caves and beaches, several churches and parks etc. Smiths Parish: Known for John Smith's beach and few other attractions. Devonshire Parish: Mostly churches, landscapes and farm lands. St. George's Parish: Lovely forts, beaches and parks other that St. George's historic town itself. This section will let you know what you can do in Bermuda each month so that depending on your travel date, you can plan your activities and visits accordingly. Not everything is open every month. For example during winter (November to March), most tour operators close down and swimming or snorkeling too are not usually possible due to low water temperature. However before getting into things to do on a month, there are few things to note. Bermuda celebrates 10 Public Holidays in a year. And many outfits and attractions remain closed on those days including most shops and restaurants. Buses and ferries ply on a reduced frequency and taxis are scarce. So if your visit includes such a day, then use This guide to plan for such public holiday. There is no particular rainy season in Bermuda. It can rain anytime. And if it happens to be a day with prolonged rain while you are on the island, here are the various things you can do on a rainy day. This is the summer time and the high tourist season. All sites of tourist interest remain open including all the public beaches, All land based and watersport activities operate in full swing such as Swimming, Snorkeling, Diving, Sunset & Sightseeing Cruises, Sailing, Boat Rentals, Kayaking, Paddleboarding, Jetskiing, Parasailing, Flyboarding, Golfing, Tennis, Spa, fishing, Hiking & Cycling, Horseback Riding, Bird Watching, Cliff Jumping & Rock Climbing, island & boat tours etc. Harbor Nights, a popular street festival takes place weekly on Front Street at Hamilton and usually between May to September. Many vendors set up food stalls and performers take to the street. Many other festivals and events take place in the island in summer. Visit Fetivals & Events to know them all. Additionally Glow Worm cruises take place between May to November. And the month of May is the only month in summer when kitesurfing can usually be done before its season ends. This is the winter time and unfortunately due to lack of tourists, many operators do not operate their tours and several attractions remain closed. However all public beaches remain open although swimming and snorkeling would be difficult without wetsuits. But, some great attractions do remain open like National Museum, Clocktower mall and several others in dockyard, and also the Aquarium, Crystal Caves, Botanical Gardens etc. Bermuda Tourism Authority initiates a host of art & cultural programs and guided tours during winter some of which are free. All these programs and tours are excellent for family entertainment. Several great Annual Events & Festivals take place in winter such as Bermuda International Film Festival, Bermuda Festival of Performing Arts, Christmas Boat Parade, Beach Art Festival and lot more. Use this winter guide to comprehensively plan your days in Bermuda during November to April. Visit Swizzle Inn (short walk from the caves) ... Bermuda's oldest pub and creator of the popular island drink Rum Swizzle. Visit Hamilton City... take a stroll along the harbor, Front Street and alleyways... Front Street is lined up with shops, restaurants, cafes etc. Walk down to Cit Hall & Arts Center. Try out the fish sandwich at Art Mel's Spicy Dicy located at the outskirts of Hamilton.... arguably the best fish sandwich in the island. Visit St. George (this is a UNESCO World Heritage Site and steeped in history)... some places to visit includes Kings Square, St. Peter's Church, St. Catherine's Fort, Tobacco Bay Beach (close to the fort) etc. Try out Gojo's Coffee Shop at Kings Square ... their own Cowboy sandwich is popular... so are codfish cakes and lobster salad.